I've been a fan of Cody Crane since my brother and I began rallying way back in the day. We traded times with him over the years and pushed each other to be better drivers. He's a ridiculously nice guy and has had a career of ups and downs. I've also been a fan of the Fire Breathing Volvo ever since it was piloted by John Lane/Ray Damitio in the 2008 Doo Wop Rally and finished second overall (we finished third overall the first day, and were looking to put up a good fight on day 2, just sayin'...). When I found out Cody had purchased the Volvo and all its rumored 600 horses from John, I hoped the call would come. When it did, I jumped at the chance. As with any high-powered car, there are some things to work out. About two-thirds of the way through stage 1, a stray rock smashed off the bleeder screw for the co-driver side brake caliper just as we rounded a L5 with a solid exposure on the outside. Cody gathered it up nicely with only the slightest of front brakes left and we pulled off at the next safe spot to assess. Unable to repair on the stage, we watched our colleagues fly by and then limped out under our own power before sweep could give us a sticker. At the end of the stage we turned in our time card and went straight to service to repair. With some ingenuity from the service crew (thanks, folks!) and the car owner, we were back in business for some more seat time. Stage 3 went pretty well. We beat everyone in O2wd and recorded a time 11th overall! I tell you, when this monster is going, it goes well. I would describe it simply as violent. It accelerates incredibly and eats tires for breakfast. It is definitely going to take Cody some time to get used to, but once he does, it could definitely win a regional overall. At any rate, things were going awesome until the brake lines loosened themselves enough to spit out more brake fluid and cause us to stop on stage 4. We tightened up back up but still lacked sufficient brake power to go at speed, so we waited for the last car to go by and told the radio operator we stopped by that we'd head to the end of the stage on our own. Since this was a spectator stage, I told Cody as we approached the spectator spot that he could "give the spectators a little extra juice here" if he wanted. I expected some gravel spray around the extra long right 2, but we ended up bringing the spectators a nice little donut as well! That brought us both a bunch of laughs. We topped off the brake fluid and made our way to the last leg of the day. The Volvo reminded us who was boss on stage 5 by mysteriously going dead pretty early on. We coasted to a safe spot and diagnosed. Just after the last car went by, Cody found a wire on the ECU had disconnected and we belted up and finished the stage. We got another stage finish in for the super special, hopefully giving the spectators some more gravel spray from the back of the pack. Stage 7 is where the exhaust broke in half, I'm pretty sure, but it hung on for the rest of the day. Or maybe that was earlier, everything is already starting to blend together. Then, on the second run of the super special, the oil pressure light came on. We ended up just disconnecting that because it was wrong and called it a day. I mean, we technically DNF'ed, but still, we got some testing done. Day 2 did not go much better. A pretty nasty crash red-crossed the first stage (everyone turned out okay! ), so we made our way to stage 10. 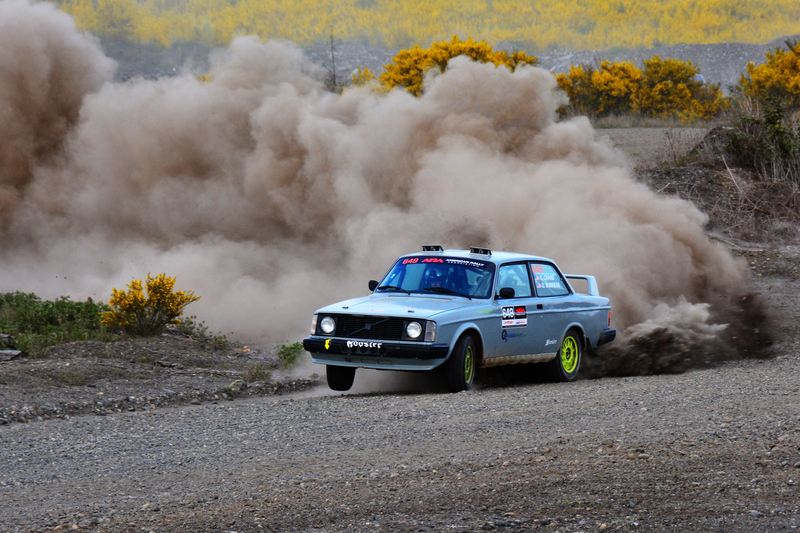 The Volvo flew through this one earning a 7th overall stage time (including the national cars) and winning O2wd. It was looking like day 2 was going well. On the transit between 10 and 11, though, the car started wandering a bit. And by a bit, I mean kind of a lot. There were some clunky noises and some tire smells, so we hopeed out at the start of 11 to check it out. Turns out the rear end was no longer fully connected to the car and was definitely unsafe and unfun to try to pilot down several more stages. We turned in our card again, strapped it back together and limped it back to service. After some discussion, repairs would have been too time consuming to do right and we were basically out of tires anyways, so on the trailer it went. It was a bummer not to get a good finish with the new car after Cody's break from rallying, but I think it got some good test miles in and it should be ready for the next outing which I hope to take part in. We'll see in the fall!